We had three different models of Tesla. One owner had it programed to play music with synchronized lights and moving doors. Another Tesla owner demonstrated autonomous driving. Most of the vehicles were owned by residents in Sussex County. Last years crowd consisted of families who were curious. 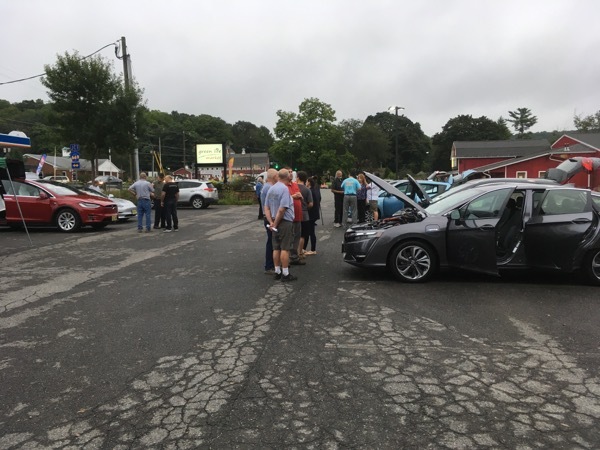 This year's crowd was interested in learning details of the vehicles and appeared to be interested in purchasing EV or Plug-In Hybrid in the future. Join us to celebrate Drive Electric Week. Members of Skylands Group-NJ Sierra Club Chapter host a display of Electric Vehicles and Plug In Hybrids. Learn why New Jersey is switching electric vehicles. Whether you are interested in EVs for access to HOV lanes access, to save money on gas and maintenance or just to make the world a greener place, there is a car for every lifestyle. Registered attendees report 160,931 electric miles driven.